Thank you to everyone who replied to our survey questions. We loved hearing from you! Based on your feedback, we are considering changing to a bi-monthly newsletter in the new year, and we will be sure to identify specific areas of need when asking for support. We are happy to hear that just like us, establishing centres and equipping and encouraging centre staff is very important to YOU! Thank you for caring and being committed to this ministry. This past month we've been busy planning for CAPSS National Conference in April, creating new resources (see below in "Making an Impact"), and Dr. Laura has had a number of speaking engagements! We're thankful for these opportunities to establish excellence and create awareness. Sometimes the headlines and the news can be pretty discouraging. But there are many life affirming and celebratory stories out there, they just don't usually make the news! So this month we want to share one of these stories with you. We want to introduce you to Christina and Alora, clients of one of our affiliated centres. This is the impact you are making when you help to establish and equip pregnancy care centres. 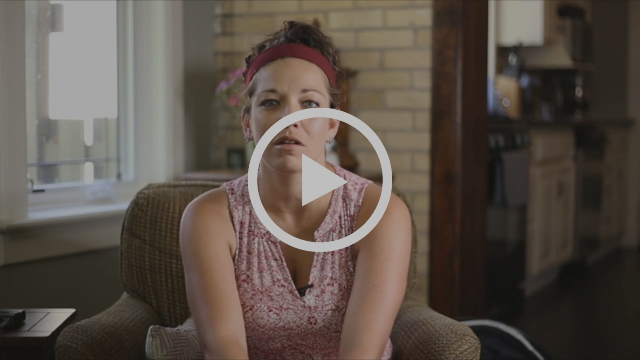 You are helping real people like Christina and changing lives. Thank you! One of the most impactful and far-reaching things you do is help establish pregnancy care centres. We know that you believe every individual, in every community, should have access to the education and support that pregnancy care centres offer. Everyone should have the freedom to make a life affirming choice. With this in mind, last month we created a new brochure - "Who will help her?" - to explain why centres are needed, the steps to take to establish one, and the difference a centre can make. We've included pictures of the brochure below. 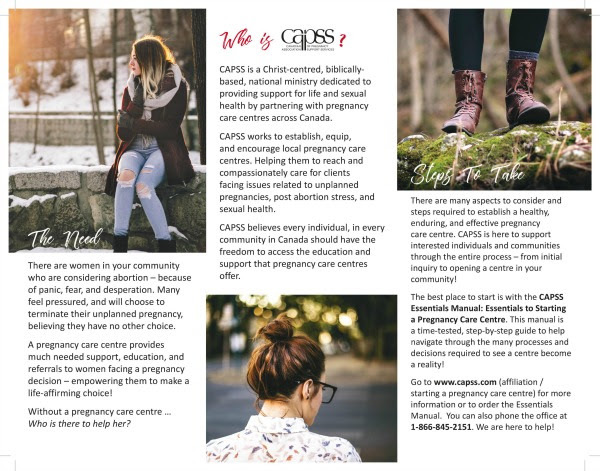 If you would like to order a brochure or would like more information, go to the CAPSS website or phone Susan at the CAPSS office (1-866-845-2151). We are here to help! Q: Looking back on 2017, what are you most thankful for? A: I'm most thankful for the growing momentum in the pregnancy care movement across our nation. And I'm so thankful for the way the Lord has connected us with one another! "The work is extensive and spread out, and we are widely separated from each other along the wall" (Nehemiah 4:19-20). Yet we are linked - arm in arm with others who remain hopeful that no life is undeserving of help and no choice is too far from the redemptive power of God. We haven't quite finished reading this book, but it's so good we didn't want to wait to recommend it to you! 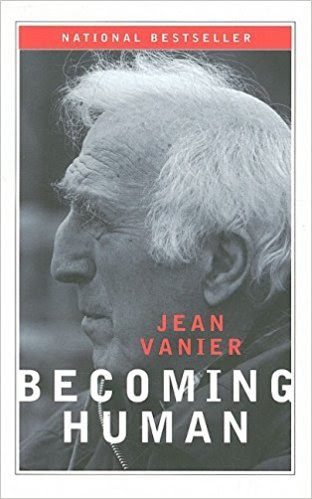 Although first published in 1998, Becoming Human, by Jean Vanier, is still relevant today and contains many profound truths. "In this provocative work, Jean Vanier shares his profoundly human vision for creating a common good that radically changes our communications, our relationships, and ourselves. He proposes that by opening ourselves to outsiders, those we perceive as weak, different, or inferior, we can achieve true personal and societal freedom. CAPSS receives no government funding and is 100% donor supported. Consistent monthly support is needed! Monthly Partners provide CAPSS with stability and a solid foundation on which to plan and move forward. Please consider committing to monthly support of $25, $50, $100, or more. We need intercessors to pray for CAPSS and for those on the front lines. Your prayer support is essential! We need you to tell others about the work being done! Please share this newsletter, our website, and our Facebook page with others who care about supporting life choices. Click here to read "A Flawed Law: Canadian 'Bubble Zone' Doesn’t Protect Women" on Pregnancy Help News. We have been busy planning for the 2018 CAPSS National Conference happening April 17-20, in Niagara Falls, Ontario! Our annual conference is a unique time of equipping and encouraging pregnancy care centre staff, board, and volunteers from over 70 centres across Canada. A lot of thought and prayer go into planning the workshop topics and the plenary speakers. And we are excited about what is coming together for next year! The theme is "Banner of Love" based on Song of Solomon 2:4. We know we are protected by God's banner of love over us and we believe we are called to reach out to the broken women, men, and families with a banner of love. The support we offer and the conversation we have, must always first start with love. This year all of the workshops will be organized into 5 main tracks: Board, Client Care, Communications and Outreach, Fund Development, and Leadership. As well as professional development, we have created time and space for centre staff and volunteers to connect, receive encouragement, and be refreshed. CAPSS annual conference equips pregnancy care centre staff and volunteers to serve with excellence. This is only possible because of the support YOU provide. THANK YOU! On October 25th, an announcement was made that Ontario passed legislation to protect women's right to choose abortion (click here to read the full report). The Safe Access to Abortion Services Act, 2017, allows for safe access zones to be established around facilities that offer abortion services as well as the homes and office of regulated abortion providers. British Columbia, Quebec, and Newfoundland and Labrador have already enacted similar safe access zone laws. Attorney General, Yasir Naqvi, said, "Our government believes that every woman in Ontario has the right to make decisions about her own health - and she deserves to do so freely, without fear. This legislation sends a clear message that we will always stand up for a woman's right to choose." At first glance, this news can be intimidating and discouraging. Or, we can see it as an opportunity to enter the conversation and bring clarity to the work we do! On some points, we agree with the government and legislation. We don't condone intimidation, harassment, or violence, and we believe a woman has the right to choose without fear or pressure from others. However, we do know that some women choose abortion because of fear or pressure from others. We also know that many women make the choice for abortion without full knowledge of what they are choosing. CBC Radio contacted Dr. Laura and asked for a statement. We are thankful that Dr. Laura was able to share the information above, as well as explain very clearly what it is that pregnancy care centres do -- offer education and support in a caring, nonjudgmental environment. Although engaging with the media on the controversial topic of abortion can be intimidating, we are thankful for the opportunity to speak the truth in love. We are also thankful for your prayers and support which provide for the work being done! We are excited to recently have held the CAPSS Director Accreditation Training (DAT) last month in Ontario. 13 Directors from pregnancy care centres in British Columbia, Alberta, Quebec, and Ontario participated. 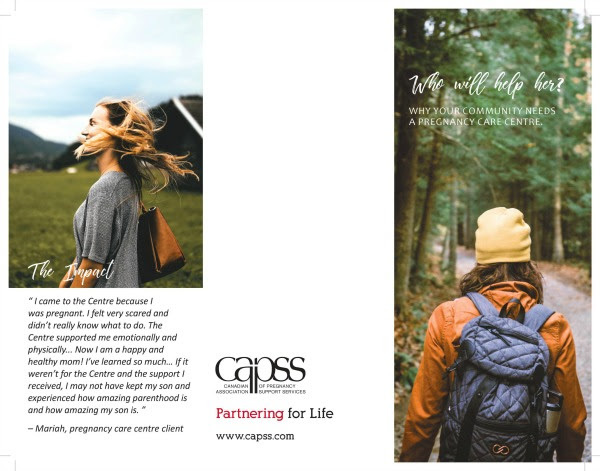 These new CAPSS Directors received training in: Right Roles (Board and Executive Director Relationships), Servant Leadership, Strategic Planning, Fundraising, Branding, Counselling the Abortion-Minded Client, Developing Programs, Training and Caring for Volunteers, and Self Care. I feel so much more focused and prepared to go forward as Director at the centre. I was feeling overwhelmed and scattered before but this training really helped. This has been a great week and I feel so thankful for the knowledge, prayer, and connections that we've been blessed with this week. Thank you! We know there will be a ripple effect of impact and excellence as these Directors take this training back to their centres. This is one of the many ways that your support is utilized to impact and equip those serving and helping on the front lines!